Dickson Police Officer Sierra Reprogal with Bridgette Crumley and newborn Isabella they had just delivered early Tuesday morning. Dickson Police officer Sierra Reprogal has been the city's police department for only a year, but knew what she had to do when she opened the van door. Dickson Police officer Sierra Reprogal’s shift started like normal Monday night. By Tuesday morning, a newborn baby was named after her. Reprogral didn’t know the mother, but she delivered her child. “It was a whole different experience. It was so amazing,” Reprogral said. 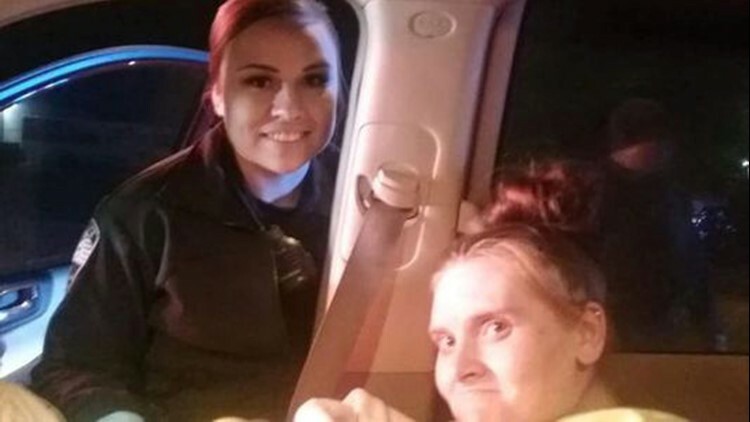 Bridgette Crumley, of Perry County, was in labor when Reprogral exited her patrol car and raced over to the van’s passenger side door. “When they pulled over, I remember thinking, ‘We are about to deliver a baby on the side of the road,’” Reprogral said. Crumley, 28, was in the van’s front passenger seat. Her mother-in-law was the driver. “She had a front row seat,” said Reprogral, laughing. Crumleys husband Bryan and 3-year-old son were in back. But once the childbirth started, the men stepped aside, including the two officers, and Reprogal took charge. “(Reprogal) looked at me. Looked at the baby where she was crowning. And I pushed and she grabbed her,” Crumley added. But Reprogal and Crumley’s bond had just started. Their life-changing moment started at about 1 a.m. Tuesday in Perry County, about 50 miles southwest of Dickson County, when Brumley started having contractions. “My water never broke or anything. I just knew I was having contractions and it was time to go,” Brumley said. The family jumped in their van and headed toward TriStar Horizon Medical Center in Dickson. Her husband made a 911 call while in route. The dispatcher sent out the message. “We looked over at the computer and saw what it was,” said Reprogal, adding that the possibility of helping deliver suddenly crossed her mind. The Crumleys got off the Interstate, but drove north instead of south toward the closer TriStar Natchez hospital. The officers, including officers Michael Carter and John Suddoth Jr., were traveling behind the van. Five minutes from the hospital, the baby girl wasn’t waiting anymore. They stopped the van in a car dealership parking lot on Highway 46 South. “By the time we pulled over, she was already crowning. We could see her,” Crumley said. Reprogal, who has a 7-year-old son, thought while following the Crumleys that she could soon see another side of child delivery. At 2:22 a.m. Tuesday she was the deliverer. "I put the baby in the mother’s arms. I made sure she was breathing,” said Reprogal, noting temps were in the 20s. “The joy afterwards was like…‘This woman just saved my baby.’ That was the exact expression I felt. I just cried,” Crumley said. She decided to honor Sierra with an addition to her newborn's name: Isabella Sierra-Marie Crumley.